This page collects information about nutritional facts and other properties of raw blueberries in summary. The information on this and other food has been gathered from various sources and may not be totally accurate. Among the data shown in this website you can find information about proteins, vitamins and minerals from raw blueberries and other nutrients like fiber, calories or cholesterol. The proportions of nutrients in raw blueberries may vary depending on the type and quantity of food, and other factors that might contribute to the modification of its nutrients. Remember that depending on the preparation, raw blueberries may vary their properties and nutritional characteristics. You can use this information to understand your dietary intake of this food or any other fruits and fruit juices. This can help you to cook better and healthier recipes including raw blueberries, but remember to consult your doctor or nutritionist before beginning any regimen or make drastic changes in your diet. In your regular grocery store in the group of blueberries you can find raw blueberries among other available foods. Below you can see information about nutritional facts, properties and benefits of raw blueberries for your body as well as the amount of each of its major nutrients. Blueberries - genus Vaccinium are also known as the perennially (all season) flowering plants. The berry with a flared crown is light green and on maturing takes on a dark blue color, with a sweet and acidic taste. The fruits growing season varies between May and August. A native fruit of North America, enjoyed by generations of natives, this highest antioxidant capacity fruit was brought to Europe, only in 1930. Consumption wise, only Strawberries are more popular in the US. 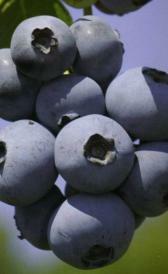 However, the Blueberries antioxidant properties surpass all other fruits, vegetables and spices, besides all seasonings. Antioxidants combat free radicals, which can affect the structure of DNA. Raw blueberries provide the best flavor and great nutritional benefits. Research and studies, establish without doubt that Blueberries improve memory and slowdown / postpone the start of mental problems associated with the aging process. Also, it is found that freezing Blueberries does not damage their antioxidant properties. Glycemic Index (GI) is low and known to have a favorable impact on control of blood sugar. Organically grown highbush blueberries have a higher concentration of total phenol antioxidants plus a higher total capacity of antioxidants. WHO recommends a generous amount of fruits and vegetables above those recommended by the Centers for Disease Control (CDC). Berries to be had at least 3 to 4 times per week, in fact daily would be most beneficial. Eye Health – blueberries protect the retina from oxygen damage and from damage due to sunlight. Anti-cancer Benefits – potential ability to lower risks of breast, colon, esophageal and small intestines cancers. Firm blueberries are shaken in a container. If they do not move freely, it indicates, that they are soft and moldy or damaged. Dull or soft and watery texture, in the presence of moisture or water can cause decay. Frozen berries when shaken in their bag should move smoothly, if not, it indicates that they have been thawed and refrozen. Crushed or moldy berries need to be removed to avoid spoiling of the remaining berries. Ripe berries may be stored in a covered container, in a refrigerator for up to 3 days. To freeze, berries spread and freeze prior storing in a plastic bag. Wash only prior eating. Note: Baking damages their nutrients and therefore they are best eaten fresh. Caution: Gall bladder or kidney patients need to avoid blueberries as they contain oxalates that can aggravate such problems. Below is a summary table of key nutrients of raw blueberries and a list of links to tables showing details of nutritional facts of raw blueberries. They include the main nutrients as well as the proportion of each. The quantity of nutrients shown in the previous table, correspond to 100 grams of this kind of blueberries.